Nothing like a little innuendo about a politician and his aide to get the fine folks over at Gawker's attention, right? While they get plenty of stuff wrong (like linking the travel aide and the guy who resigned), and we don't think it breaks any new ground, with the national media readership of Gawker itself, the piece is certainly to elevate the next round of stories (if there are any) into the national media conscious. That is a big if, we suppose. In late January, Rutherford announced that an unnamed staffer was threatening to go public with claims of sexual harassment. (The treasurer attributed the threat, which was delivered by a lawyer speaking on behalf of the staffer, to a political opponent.) Two days later the Sun-Timesreported that the staffer in question was a man and had resigned from Rutherford’s office, citing the “intimidating news conference” at which the treasurer announced his threat to go public. From there, it winds through the scenario and (we think, admittedly) the reporter is fuzzy on some of the facts. 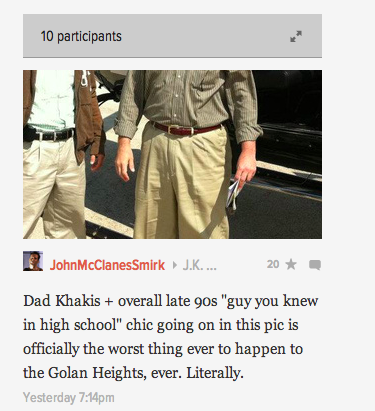 But as you'd suspect, the comments at Gawker didn't really focus on the politics and the facts of the case. Rather...they chimed in on the important stuff: Dan Rutherford's wardrobe. The pleated khakis got a lot of play. 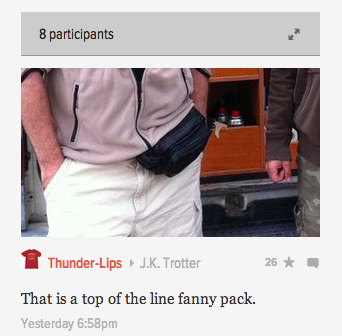 So, too, did Dan Rutherford's fanny pack. If this is the worst of the fallout from Dan's Facebook timeline, then that's not too terrible, we think. 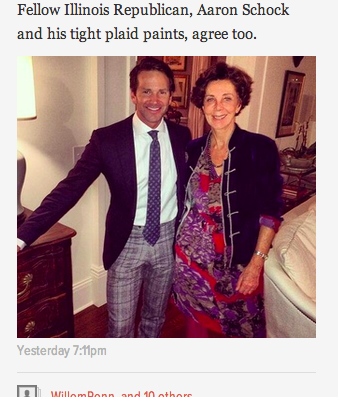 And...even Congressman Aaron Schock even got hit with some collateral comments. Don't hate on the pants, folks.